One of the most enigmatic geologic units on Mars is the Medusae Fossae formation. Made up of four individual areas, it sprawls for more than 5,000 kilometers (3,000 miles) along the boundary between the cratered southern highlands and the lowland plains to the north, and between the volcanic centers of Tharsis and Elysium. Scientists have puzzled over the formation's origin, age, and nature since it was first studied in detail in the late 1970s. The formation is lightly cratered, which points to a geologically young age. It shows many surface features produced by wind, suggesting it is made of soft, fine-grained, and easily eroded materials. And much to scientists' surprise, in the early 1990s Earth-based radar found it reflects almost no radar signals, earning it the nickname of "Stealth." Memnonia Sulci, the area shown in this image, lies within one of the formation's four units. This scene is some 730 km (450 mi) northeast of the Mars Exploration Rover Spirit in Gusev Crater. Memnonia displays several of the Medusae Fossae formation's most characteristic features. The image is a mosaic of daytime infrared frames taken by the Thermal Emission Imaging System (THEMIS), a camera operating with 10 infrared bands and five visual ones on NASA's Mars Odyssey orbiter. Sweeping around Mars onboard Odyssey since 2002, THEMIS has woven a tight network of images that now cover the planet at 100-meter (330-foot) resolution. THEMIS has also imaged selected regions at 18-meter (59 feet) resolution using its visual-wavelength imager. Streamlined hills like these occur when windblown sand and dust particles carve into soft, weakly compacted material, such as silt, clay, or volcanic ash. The ridges and grooves generally follow the direction of the wind. Geologists call these distinctive features yardangs. The yardang ridges here show two main orientations: north-south and northeast-southwest. This may reflect different wind patterns over the history of the formation. Or it may be caused by local topography directing the winds. But what is the material making up the Medusae Fossae formation? Scientists' most widely accepted idea currently is volcanic ash or a type of soft rock called ignimbrite. An ignimbrite is what's left when flow of ash, rock fragments, and superheated gas pours out of a volcano, cools, and solidifies. On Earth, ignimbrites may be dense or porous, and light or dark in color depending on the composition. While not as weak as ash, ignimbrites still erode easily. The inset photo at right shows a relic impact crater that now stands isolated as a butte. It's unclear whether the flat top is the last remaining part of the crater's floor or if the crater is more or less intact, but full to the rim with sediments. The result in either case is what geologists call inverted topography, and the Medusae Fossae formation has abundant examples throughout its extent. Inverted features form whenever something happens to make the ground more resistant to erosion. For example, a lava flow down the bottom of a stream valley may become a winding mesa if the ground is softer than basaltic lava. In a similar way, an impact can line a crater's inner walls with melted rock and make the bowl more resistant than the landscape around it. That seems to have happened here. Erosion has stripped away any overlying material, plus almost all the ground around the crater. As a result, the impact crater (or its last remaining part) becomes a free-standing butte, one or two hundred meters high. It is now surrounded by the wind-whittled remnants of a much thicker sheet of material. The white patch in the inset at left looks intriguing. Could it be a salt deposit — or a dried-up lake bed? Or even a sheet of ice? This image underscores the difference between what we would see and what THEMIS saw in taking this image. While THEMIS does work at visible wavelengths, it is primarily an infrared camera, designed to measure heat radiation. Here it has imaged the landscape in the infrared, so features that appear bright are features that are warm. 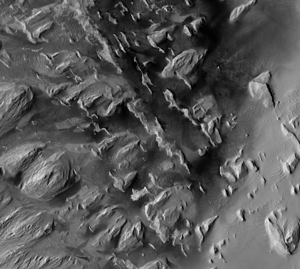 The closeup view at right, taken by the HiRISE camera on NASA's Mars Reconnaissance Orbiter, shows the visual view. That bright area is actually dark material (perhaps sand), heated by afternoon sunlight. It lies between the knobby hills that are the last surviving remnants of the Medusae Fossae formation at this location. It's not completely clear whether the dark material is lying on top of the underlying surface — or if it is the underlying surface, slowly emerging into view as material covering it is removed. Take a look around in the big THEMIS mosaic for other white spots. Chances are good that they too are patches of dark material, glowing warmly in the sunlight. For a long time now, the Big Story about the Medusae Fossae formation has been removal. Currently, this formation is being eroded, not built up. As a result, older features are coming to light as winds remove the overburden and exhume them. Here we see a small plateau, built up of at least two layers. Winds are carving it away around the edges, where the layers appear as giant stair-steps. On top of the plateau lies an old impact crater about 10 km (6 mi) wide. Long buried, it is coming into view as the sediments covering it are vanishing in the wind. Looking into this one small crater — which is tiny on a Martian (or lunar) scale — we see details and small features that no one has begun to unravel yet. 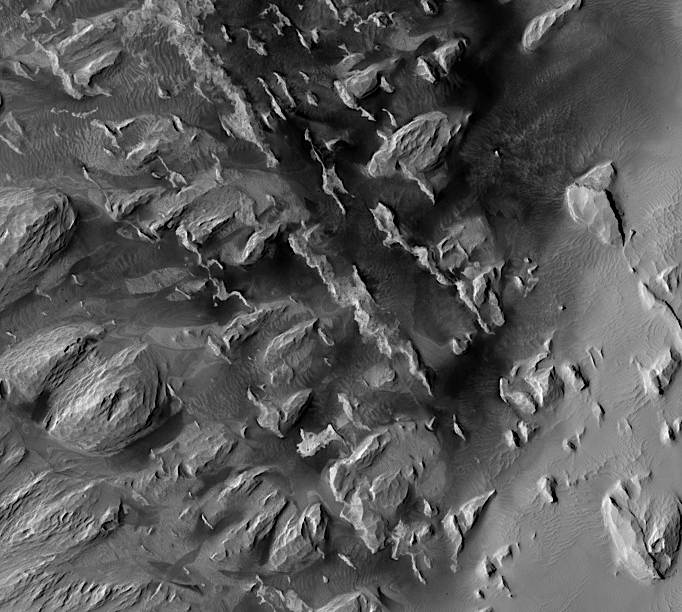 The closeup view at right shows pieces of the buried crater's rim, plus outcrops that may reflect the plateau's underlying layers. Overall lies a wind-etched blanket of dusty debris. The mysteries and riddles of the Medusae Fossae formation alone could keep Mars scientists busy for a long time to come. When this impact crater formed, the blast threw out debris that has covered the ground all around. 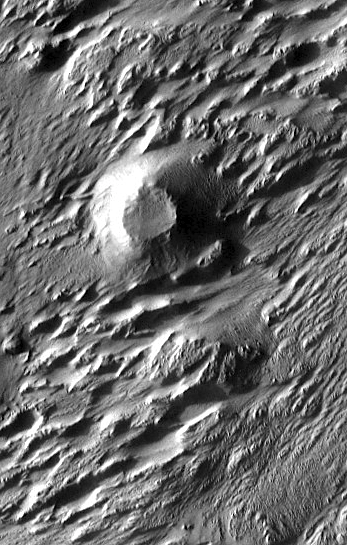 This slowed erosion and left the crater as a knob, full to the brim with wind-blown sediments. This image, about 6 km wide, is part of THEMIS VIS frame V27090004. As the soft material erodes, dark patches emerge into view between the hills. These may be areas of loose dark sand or exposed basalt bedrock. This image, 2.5 km wide, is part of image PSP_006273_1715 taken by the HiRISE camera on Mars Reconnaissance Orbiter. An old crater is being slowly exhumed by the wind. 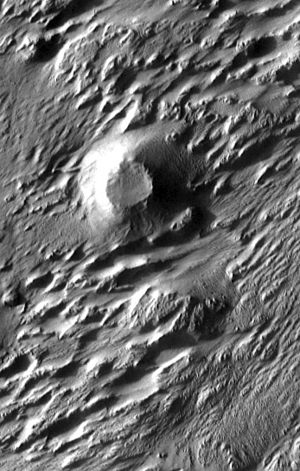 At least two and perhaps three layers are visible within the crater. These presumably represent episodes in which the Medusae Fossae formation accumulated additional sheets of ash or ignimbrite. Dark streaks running down the slopes show some material is loose and on the move even today. Such streaks remain visible until fresh dust falling from the air lightens the ground, a process that takes only a few months to a year. This image, 3.7 km wide, is part of image ESP_016215_1730 taken by the HiRISE camera on Mars Reconnaissance Orbiter.